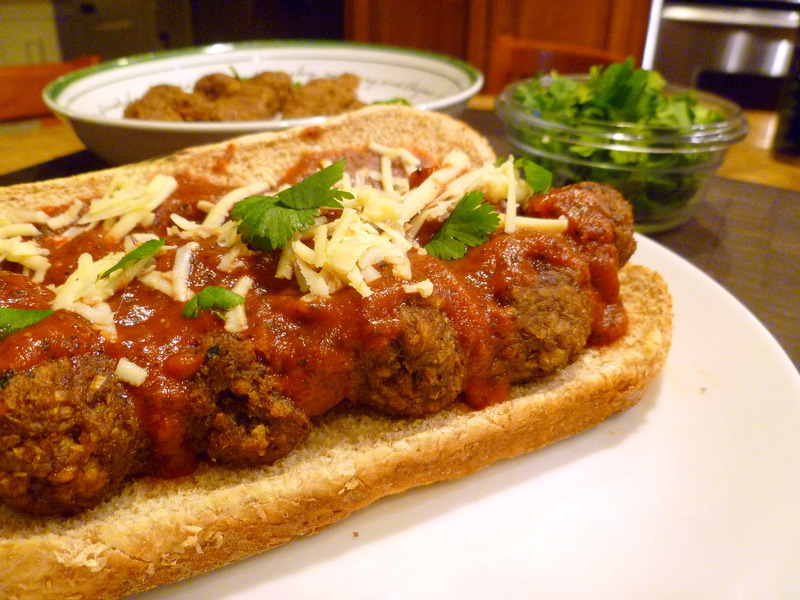 “In my meat-eating days, boy did I love a good meatball sub from Subway. The soft bread, Italian style meatballs and marinara sauce were a quick fix when I was super hungry and needed something fast and delicious. This version is as every bit delicious and of course, better for you! This can also be super quick if you made meatballs earlier in the week. The meatballs are quick to make and freeze great. I make a large batch then use them later when I want a meatball sub or Greek gyro. This is a fabulous dish for game nights when you have the manly men coming over to watch the game or hang out with the guys. I haven’t had anyone question my “meat” yet and they all ask for seconds. Shhh! Don’t tell them they’re eating a vegan dish! They might feel they’ve just to traded in their trucks for a Prius. This makes about 6 sandwiches. I’d recommend doubling the “meat” recipe so you can refrigerator or freeze some for other uses. I never buy breadcrumbs as I usually have bread around. I typically store mine in the freezer so I just take 2-4 slices out, break them into large pieces and throw them in the blender until they are small crumbs. Spread them onto a large baking sheet and splash a few dashes of olive oil. Sprinkle on your herbs of choice (I like basil, oregano and garlic powder for this recipe) and stir to evenly coat. Bake at 350 until crunchy, about 5-10 minutes. These are way yummier than store bought, guaranteed! Make your breadcrumbs and set aside. Spray a large cookie sheet with non-stick cooking spray and set aside for the meatballs. In a large bowl place all the ingredients except breadcrumbs and mix thoroughly. It’s easiest to mix this with your hands. Add about 1/2 cup of the breadcrumbs and mix again. Mix in the rest of the breadcrumbs depending on if you think the mix needs a bit more dryness or not. Shape the mixture into 3/4-1 inch balls and place on the cookie sheet. Place in oven for about 8-10 minutes, turn, spray lightly with cooking spray (optional but it will help it get a browned effect) then cook another 3-4 minutes or until warmed through and slightly browned. Heat all ingredients for marinara sauce until simmering. Simmer 5-7 minutes for flavors to meld. Taste for salt and pepper. Turn off heat and set aside. Make the meatballs. While in the oven, start the marinara sauce. If you are going to saute an onion and green pepper, chop to desired size, throw in a heated skillet with some olive oil and saute. Set aside. Open hoagies and place in a preheated oven at 350. Toast a few minutes then remove. 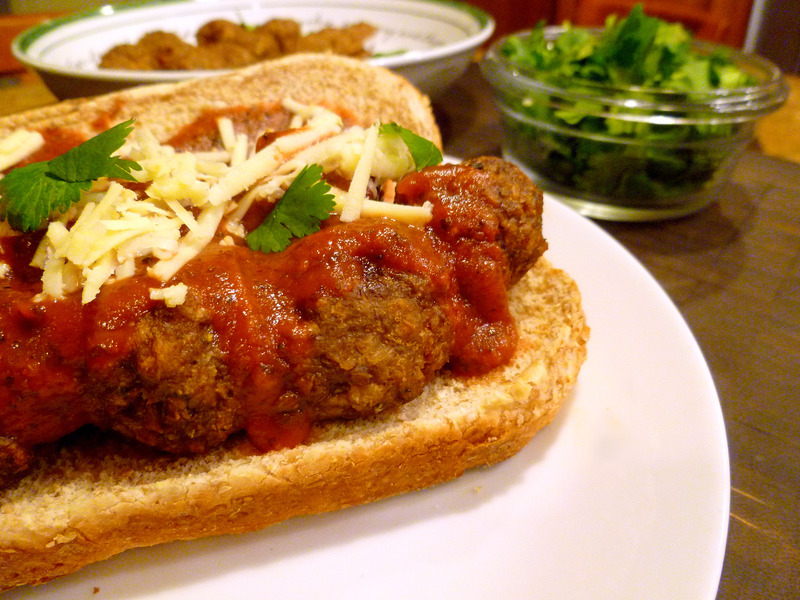 Place cooked meatballs in toasted hoagies, cover with sauteed veggies, marinara and grated pepper jack cheese and cilantro. Eat with plenty of napkins. The Gimme Lean will be easier to work with if you leave it out for about 30 minutes before working. If you meatballs are too dry, cook for less time or cook loosely covered with foil. I like to double the meatball batch then refrigerate extras for other meals. They also freeze great. The batch above should be enough for about 6 sandwiches. Funny, I just posted about vegetarian meatball subs and now I see your post. Meatballs are really making a comeback. That’s great! I love the variety you can get in a veggie meatball! I will definitely be trying this one soon! I was thinking about making a bunch of these to take to a potluck. Do you think if I wrapped them individually in foil and baked them and took them to the potluck they would get too soggy or it would work? Sorry for the delayed response! I store them overnight often and find them not to be soggy at all. If you let them sit a little before wrapping, I think they should work. Have you tried them yet?